Natural face care is extremely important to having more youthful, radiant skin, and keeping it that way. Everyone wants clear, younger looking skin, especially on our faces, but with the majority of skin care products containing harsh chemicals it really is hard to achieve that. Department store brands strip your skin of it's much needed natural oils and at the same time these chemical are working their way into your damaged pores. Natural face care will ensure your skin will have all it needs to stay youthful and healthy for as long as possible. How we look after our skin now dictates what it will look like as we age. Many of us have spent hundreds of dollars on products to make our skin look healthy, but unfortunetly these products do not truly make your skin healthy. The only way to have truly healthy skin is to make sure it is nourished and hydrated properly. Healthy skin is beautiful skin! The skin on our faces is especially more sensitive to the many harsh products out there. Chemicals found in beauty products are not only bad for your skin but they are only a superficial fix. Quit using them and sometimes your skin looks worse then when you started. Natural skin care always starts on the inside with a healthy diet and plenty of water. 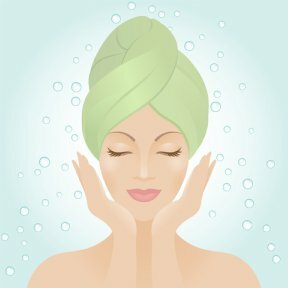 Flushing toxins out of your body helps to keep skin clear and nutrients provide it with what it needs to maintain it's strength and over all health. For all of the information you need on what exactly your skin requires from the inside, click on the link below. If you already have a healthy diet then you are already half way there so just read on! A good natural face care routine should consist of a gentle cleanser and or exfoliater, a refreshing toner and of course a nutrient packed moisturizer. The following are just basic guidelines to get you started. For more detailed information click on the provided links. To save you time we also have links to the most recommended and economical, natural and organic skin care products. These natural products all have excellent reviews and have quite a following of customers, some of which have won awards, and like I said will not cost you an arm and a leg! If you are purchasing a cleanser (or any other skin care products for that matter) be sure to read labels and most importantly, read the list of ingredients. You can usually tell pretty quickly if a product has chemicals in it or not just by looking at the first few ingredients. Benzoyle Peroxide, Synthetic Dyes and Fragrances, Petrochemicals, Parabens and Paraffin are just to name a few of the main ones. Unfortunately cleansers usually contain the most damaging chemicals out of all skin products. Look for products that are 100% natural and if they are organic, that is even better. Some products can be all natural but still have pesticides in them, so be sure your products are pesticide free. If on the other hand you choose to make your own natural face cleanser we have several different recipes. Choose a cleanser or exfoliater that matches the type of skin you have. Always try to prepare ahead of time so that your cleanser (or what ever recipe your making) is readily available. We are more inclined to use it every day if it's more convenient. I know when I stumble out of bed in the morning the last thing I want to do is mix up a batch of facial cleanser! Be prepared. Just a bit of time added to your daily routine can make all the difference in the world. An effective natural toner will help even out skin tone, restore its natural ph balance and also remove any impurities or toxins that your cleanser may have left behind. Toners are often over looked but they really are important for natural face care. Think of it as prepping for your moisturizer. Your skin can then take full advantage of all the nutrients you apply after. If you are purchasing a natural face moisturizer more expensive does not mean better quality. Compare a few different products, checking each for ingredients and price. Don't fall for fancy packages and always pay attention to how labels are worded. Sometimes they can be very deceiving. Choose creams that have vitamins, minerals and botanical ingredients. Choose moisturizers that have protective ingredients in them as well. You want to keep your skin hydrated and protected from every day enviromental damage.Nature has provided us with ample ingredients that do just that! The following link will tell you exactly which ingredients to look for and if your making your own you get to choose which ingredients to include in your recipes. One of the most important things we can do for skin is naturally protect it from the suns harsh rays. The skin on our face is constantly exposed to the sun, not to mention pollutants. This is also important for keeping those nasty wrinkles away! Eating a diet high in beta carotene can help. As it accumulates in the skin it provides some protection from the sun. Do not rely on this alone! Always, always wear sunscreen! Years down the road you will be glad you did. Not only does it help prevent wrinkles but it also reduces your risk of skin cancer. With all we know it still surprises me that many people still don't wear it. When shopping for a natural sunscreen be sure it has a broad spectrum. UVA, UVB & UVC. Natural sunscreens tend to be mineral based and so they are sometimes whitish when applied. If this bothers you try products that use nano zinc or titanium dioxide. They tend to dry a little clearer. Find a product you like and after you apply it, dust your face with a little mineral makeup and you are good to go! Remember sunscreen is one of the most important parts of natural face care routine. I can't stress that enough. Because the area around the eyes is so delicate and this is where our first wrinkle usually appears we have set a side a page that focuses strictly on eye care. There are natural recipes that target wrinkles, puffy eyes, dark circles and anything else you can think of. This also has its own page since our lips require different care than the rest of our face. Browse through the recipes and choose out your very own customized natural face care routine! Remember if your taking the homemade route preparation is very important. Set aside time and make sure your skin recipes will be ready when you need them. Preparation and convenience is key to keeping a good natural skin care routine and obtaining beautiful, vibrant skin. Keep in mind that once you have done it a few times you will also get faster and more efficient so making your own skin treatments will be a snap! Do not feel bad if making your own skin care treatments is just not an option for you. Like many women today you may have more than enough on your plate. Don't stress! (stress is not good for your skin either) There are many excellent natural skin care products out there that will give you just as good of a result as homemade. Just be sure the ingredients are truly natural or organic. Follow these guidelines and you will be well on your way to having natural, healthy glowing skin!